There's a new powerful and easy to use tool on Archives that allows you to build your family tree. We've been developing this behind the scenes for months, and now it's available in the Archives member area under the Family Trees tab. As one of the most important additions to Archives.com since its launch in July 2009, we're eager to hear your feedback. Please email us about your experience using Family Trees at familytrees AT archives.com. Inside Family Trees you'll see simple and clear directions to help you get started. Begin by starting a new tree from scratch, or import an existing tree (GEDCOM file). Add vital, military, census, and immigration records from Archives' extensive database to members of your tree. 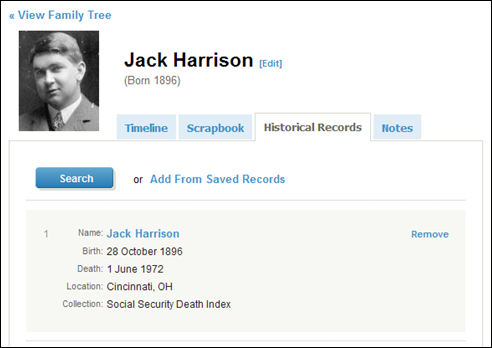 Maintain a profile for each person in your tree with a timeline of vital events, photos, and notes. Personalize each profile by adding a profile picture. If you have any questions about Family Trees, please click the Family Tree Help link. There you will find a tutorial, as well as answers to commonly asked questions. Note: All GEDCOMs that were uploaded to Archives will now be displayed as family trees, and will be accessible from the FamilyTrees tab. We hope you enjoy using this new tool as much as we do! Please be aware that we've already planned a number of enhancements to Family Trees. We'll keep you updated on our progress here, on the Archives.com blog. Do you have a feel-good or funny story you'd like to share about using Family Trees on Archives.com? Please email them to us at familytrees AT archives.com.